I cooked an actual meal last night (an eggplant and chickpea stew from Canadian Living magazine) and even personalized the recipe by adding in a few of my own ingredients! (Orange peppers and kale, in case you were wondering 🙂 ) It’s really easy – obviously, since I attempted it! And it turned out really well too – obviously, since I’m sharing it with you here! This left me feeling culinarily inspired, and ready to tackle some dessert. I found this recipe on the TasteFood blog and think I’ll try it next. The author described my ideal oatmeal cookie, except for the raisins. I’ll be substituting dark chocolate and/or dried cranberries in my version. I’m going to try and make these later this week, and will let you know how it goes! 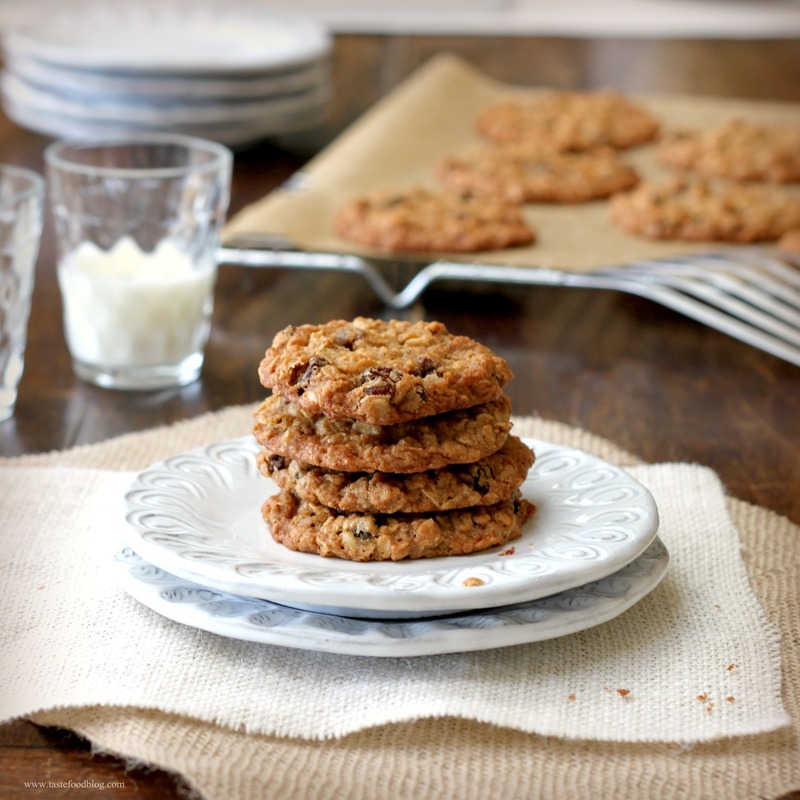 Refrigerating the cookies before baking will ensure a thicker, chewier cookie. Makes about 30 – 2 inch cookies. Whisk butter, sugar, egg and vanilla together in a large bowl until smooth. Mix flour, cinnamon, baking soda and salt together in a small bowl. Stir the flour into the butter and sugar and thoroughly combine. Stir in the oats and wheat germ; then add the raisins. Refrigerate the dough for at least 30 minutes. Preheat oven to 375 F. (190 C.) Drop rounded tablespoons of the dough onto a baking sheet lined with parchment, leaving 2 inches between each cookie. Bake until cookies are set in the middle and golden brown, 12 – 14 minutes. Remove from oven and cool on a rack. just don’t let him find out there is “wheat germ” in them…! haha good advice!! we’ll keep that part between us…! I am sending this to Linda and volunteering that you make these for the cottage. I think the Big Fresh would like these! And the best part is, I’ll have plenty of time to make practice batches before the cottage! Not that I’ll want to, of course, it’s just that I’ll have to for research purposes… 😉 Thanks for the comment!